Have a question for Hostel New York? "Beach within 20 minutes walk." "Perfect location in the city center." 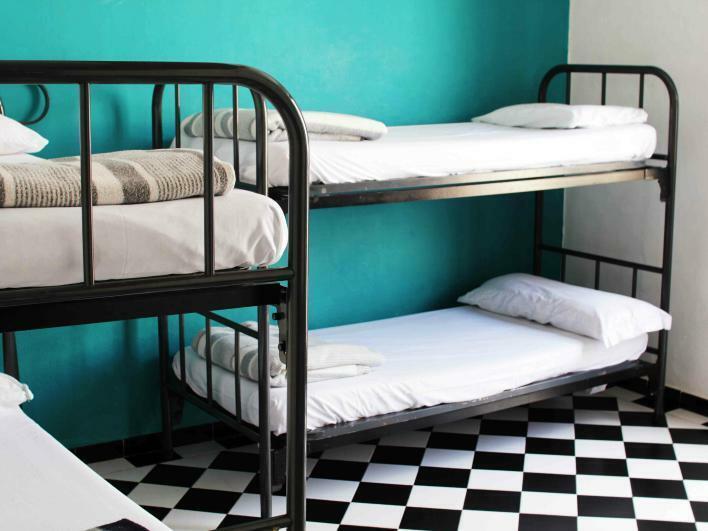 Ideal for fun and relaxation, Hostel New York is located in the Gotic area of Barcelona. Only 0 km from the city center, the hotel's strategic location ensures that guests can quickly and easily reach many local points of interest. A well-kempt environment and its proximity to Barcelona Vibes, Sanovation Barcelona by Euro Organic Collection, 4Retinas- foto-diseno give to this hotel a special charm. Offering hotel guests superior services and a broad range of amenities, Hostel New York is committed to ensuring that your stay is as comfortable as possible. A selection of top-class facilities such as facilities for disabled guests, luggage storage, Wi-Fi in public areas, family room, tours can be enjoyed at the hotel. 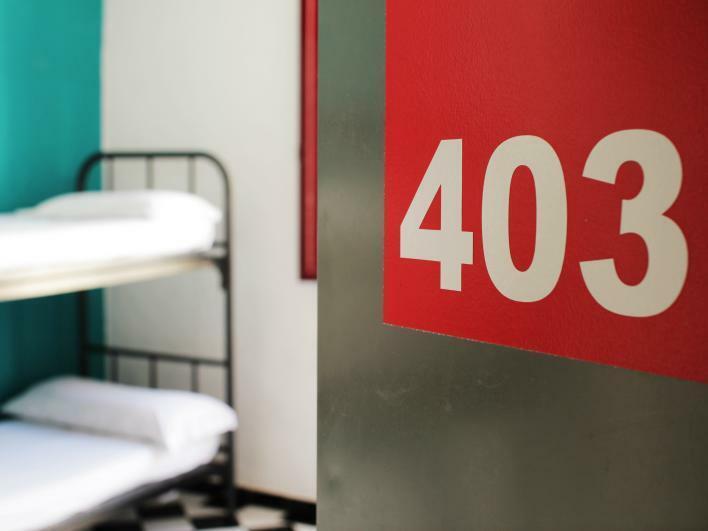 The ambiance of Hostel New York is reflected in every guestroom. non smoking rooms, heating, desk, balcony/terrace, fan are just some of the facilities that can be found throughout the property. Besides, the hotel's host of recreational offerings ensures you have plenty to do during your stay. Discover an engaging blend of professional service and a wide array of features at Hostel New York. "Close to La Rambla and high street and the beach are in walk..."
Nice and clean place. Perfect location in the city center. Beach within 20 minutes walk. Recommend. If you like stenchy beer stained walls, smelly lockers, unhelpful staff, late breakfast, non-working computers, broken wifi, dirty bathrooms, rented sheets and towels, no soap, noise all night, and a maid that does not get off the lobby computer this is the place for you. However, it is very conveniently located, cheap, and for travel soldiers. Location is good. Close to La Rambla and high street and the beach are in walking distance. The location is just great: in the centre, 7 min walk to subway, 15 min walk to the beach, shopping area, many small restaurants, right in the centre on Barcelona! But room is very simple, no ac, but fan. Anyway great value of money and very nice and polite staff, we had a great time, thanks! my first budget/hostel accom - it was nice! not as crowded as I thought! kinda noisy where our room is situated (people and vehicles + deliveries) Overall, not a bad place. Overall, I would recommend this hostel for its fantastic location. It's surrounded by beautiful buildings, wonderful restaurants, and great bars. It's also within walking distance of the metro and the beach. It's a safe zone, too (as city centres go!). We stayed in a private double room. The rooms were of a decent standard for hostel rooms, though the prices were exorbitant (though it was peak season, and everywhere in Barcelona was extremely expensive). There were two single beds rather than a double, but that's quite common. On arrival, we had to pay extra to rent bedsheets and towels, which I felt to be ridiculous. I also felt that this should have been mentioned on Agoda. The internet's fast, but it's only in the lobby. Dunno what else to say! It was a pleasant stay. The room was small but comfortable, there were lockers in the room that you could store your stuff. The window was small with no view but then again we used the room just to sleep at night. The common facilities like toilets and showers, corridors and all were very clean ! The Staff working there, were very friendly and fluent in English. They gave us good advice on restaurants to go to, directions and transportation tips. Super séjour, auberge de jeunesse très bien placée, personnel vraiment gentil, grandes chambres, grande salle de bain, située a coté des ramblas, juste en face d'un petit bar Français très cool et près du bar de manu chao! ordinateurs avec internets disponibles à la réception gratuitement! Pensez à prendre un drap et une serviette! Cama sem lençóis, sem toalhas para banho. Colchões manchados, almofada com cabelos de anteriores clientes e o quarto cheirava mal. WC muito sujos. Não existe um acompanhamento por parte dos funcionários ate ao quarto. Cacifos podiam ser abertos por qualquer pessoas que dormisse no quarto. Conclusão vi-me obrigada a ir a procura de outro Hostel super agradável, realmente LIMPO e funcionarios super simpaticos e atenciosos... Pelo mesmo preço mesmo em frente ao mercado.